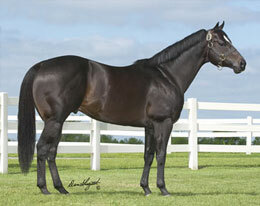 Ivory James sired two finalist to the Grade 3 $197,700 Sam Houston Derby. HOUSTON, TX�APRIL 14, 2017�Royal Vista Ranches' IVORY JAMES sired two finalists Friday night for the Grade 3 $197,700 Sam Houston Derby Friday night at Sam Houston Race Park. The 10 fastest qualifiers, from eight trial races contested tonight, will return to Sam Houston Race Park on Saturday, April 29th and vie for the $79,080 winner's purse going 350 yards. Trainer Leon Bard saddled 6th fastest qualifier Sochi Special, by IVORY JAMES, for owner/breeder Pamela Stone. It was the Texas-bred, from the Royal Shake Em mare RC Shake Em Blue, finished second in the 6th trial. Ridden by jockey Francisco Calderon, Sochi Special completed the 350 yards in :17.592 seconds, a 94-speed index. Second in last year's Sam Houston Juvenile, the gray filly has compiled a (6) 2-3-0 record and earned $20,850. IVORY JAMES second qualifier Thriving Ivory, also finished second din her trial, completing the 350 yards in :17.652 seconds to garner the final qualifying spot. Angel Sanchez conditions the RG2-placed filly for owner Angel Hernandez. Bred in Texas by Bobby D. Cox, from the First Down Dash mare Shes Dashin First, Thriving Ivory has compiled a (7) 2-2-1 record and banked over $110,000. For the complete list of Sam Houston Derby qualifiers, times, sires, dams, owners, breeders, trainers, and jockeys CLICK HERE.